The Uniquestay Mihkli hotel is a newly renovated trendy three-star hotel in central Tallinn housed in a historical building situated close to the Estonian National Library under a ten minutes walk from the charming Old Town Square the centre for all entertainment. 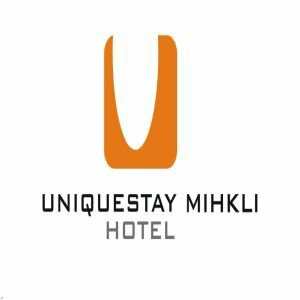 The Uniquestay Mihkli is an affordable hotel for both leisure and business travelers it offers fresh trendy and convenient accommodation with friendly service. The hotel has altogether 84 rooms with every modern convenience housing over 150 guests.Prices include hot English-American and cold Scandinavian style selection buffet breakfast Gym with aerobic machines and free weights and sauna free of charge for clients All rooms feature 24-hour free internet connection and flat-screen computers there is also complimentry wireless internet connection in all areas of the hotel.Secure parking in the hotel courtyard is free of charge which is an excellent feature being so close to the Old Town. Restaurant facilities include LA Boheme a trendy restaurant offering all day snack menusand a cocktail bar and funky A la carte Menu. The Tricky Ants folkoric restaurant offers a popular dinner show featuring folk dancing and live music. Freshly renovated spacious and trendy room with natural coloring. Each standard single room features in-room cyber-desks with flat-screen computers and free internet for 24 h free tea and coffee-making facilities and digital mini-safes. Freshly renovated spacious and trendy room with natural coloring. Each standard-room features in-room cyber-desks with flat-screen computers and free internet for 24hours free tea and coffee-making facilities and digital mini-safes. Twin and double rooms can accommodate two adults with a maximum occupancy of three guests with a rollaway bed. ZEN-rooms are the business-class rooms in Unique stay Mihkli hotel which all feature whirlpool baths Salt lamps bathrobes slippers deluxe bathroom amenities and minibar. Zen-rooms can accommodate two adults with a maximum occupancy of three guests with a rollaway bed. ZEN-suite is a very large business-class room in Uniquestay Mihkli hotel which features whirlpool baths Salt lamps bathrobes slippers deluxe bathroom amenities and minibars. ZEN-superior is very large business-class room in Unique stay Mihkli hotel which features separate seating area large whirlpool bath flat-screen tv Salt lamp bathrobe slippers deluxe bathroom amenities and minibar. Zen-superior can accommodate two adults with a maximum occupancy of three guests with a rollaway bed. PLEASE DRIVE TOWARDS THE CITY ON TARTU ROADAND FOLLOW THE SIGNS TO CITY CENTER. ON VABADUSE SQUARE KEEPGOING STRAIGHT ALONG KAARLI PUIESTEE WHICH CHANGES TO LUISESTREET. ON THE CORNER OF LUISE AND KOIDU STREET TURN LEFTAND YOU SEE THE MIHKLI HOTEL AT THE NEXT STREET-CORNER. CUISINE TYPE - INTERNATIONAL LOCATION - ON PROPERTY DISTANCE FROM HOTEL -0MI / 0KM OPEN 7PM-12PM FRIDAY AND SATURDAY JULY 1ST-SEPT 15TH. KAVAL-ANTS RESTAURANT IS A TRADITIONAL ESTONIAN-STYLED RESTAURANT WHICH SERVES BOTH ESTONIAN AND INTERNATIONAL FOOD. SPECIAL ESTONIAN TRADITIONAL EVENINGS WITH FOOD AND ENTERTAINMENT TAKE PLACE IN THE RESTAURANT EVERY FRIDAY AND SATURDAY EVENING.